Runner-up to John Gosden’s big hope Calyx in the Coventry Stakes at Royal Ascot, the Martyn Meade-trained Advertise was sent off the 11-10 favourite to go one place better. Frankie Dettori, who rode Calyx at Ascot, kept Advertise widest of all before asking for his effort two furlongs out. While the response was not totally immediate, he soon hit the front from Konchek and Charming Kid, taking the six-furlong Group Two contest by two lengths. Gosden’s Legends Of War, ultra-impressive on his only previous start, was very disappointing. Meade said: “Wow, that’s all I can say. I’m so thrilled. “He’s done everything right, but of course you never know until you get on to the racetrack. I think he could prove to be a really good horse. “He’s takes a bit of time to get going, which was why Frankie got at him, but we were thinking about the Superlative here on Saturday over seven furlongs – that might be his trip, but he can cope with this. 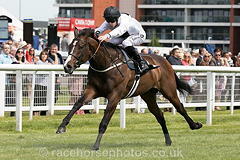 The July Stakes is the oldest surviving event for two-year-olds in the British flat racing calendar. It was established in 1786, and it was originally open to horses of either gender. The conditions initially stipulated that those horses sired by Eclipse or Highflyer should carry an additional weight of three pounds. The July Stakes is currently held on the opening day of Newmarket's three-day July Festival meeting. The equivalent race for fillies is the Duchess of Cambridge Stakes.